Fiber Camp and the Knit North Yarn Crawl - That's a wrap! It's been a few a weeks now since Fiber Camp and the Knit North Yarn Crawl, so its about time I write about all of the fibery fun I had in March! As always, Fiber Camp was a blast! Last year was my first time attending, and it was such a pivotal event for me in my knitting career. Up until then, I had been toying with the idea of designing and being more involved with the knitting community in general. The inspiration overload that is Fiber Camp is what ultimately pushed me to take the leap! This year, it was fun to return and teach a class. Ana Campos from the Toil & Trouble and I co-taught a class on designing and publishing knitting patterns. For me, it was a great way to share all of the knowledge I have gained in my first year of designing. Basically, the class was an overview of how to see an idea through from sketch to publication. I'd love to organize these thoughts into a "real" class/lecture sometime down the road. I also took a few classes, because the best part of Fiber Camp is learning new things. Last year, I learned about the pom pom maker from Sheeri, and let me tell you, now I always get compliments on my pom poms. I also spun yarn for the first time with help from Willa. This year, I learned some of the magic behind double knitting thanks to two awesome classes taught by Alasdair Post-Quinn of Fallingblox Designs. If you are into double knitting, you should be on the lookout for his upcoming book due out next winter. He has some jaw-dropping designs -- you can see a sneak peek of what's to come on his latest blog post! I also spun yarn for the second time thanks again to Willa and Joanna. I was thinking of making spinning an annual event, but now that I have my very own drop spindle and fiber (thanks to the swag bags), I may have to try it out more often. Fiber Camp was followed by yet ANOTHER weekend of full on knitting! I think March is my favorite knitting month. Though it was a crawl, I must admit that I didn't do much crawling. Instead I parked myself at Circle of Stitches and let the crawl come to me. The advantage of this strategy was that it allowed me to put some precious knitting time in while still getting to meet, mingle, and of course knit with tons of new people. Plus, not only did I get to see a bunch of Maritana shawls in the wild (see pics below), I also got help pick out colors for those about to cast on. 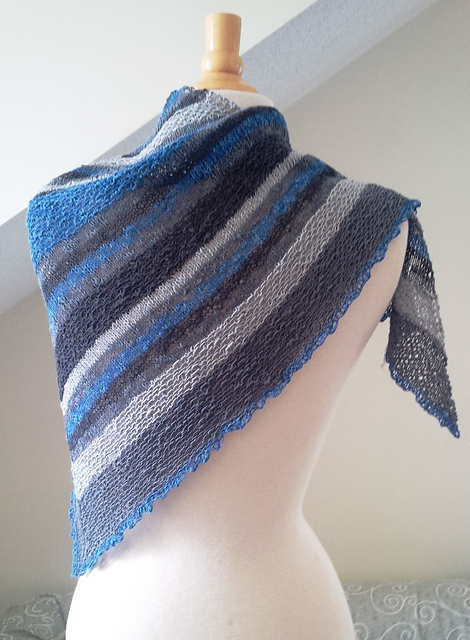 Check out the Maritana made by Mary-Kate (mkbourn on ravelry) in Shibui Kavo! Hi I'm Meghan! I started knitting a few years ago, and like every other knitter I know, I was immediately hooked. Besides knitting, I'm a postdoc in Mechanical Engineering at Massachusetts Institute of Technology. Ever since I moved to Boston almost five years ago now, I've fallen in love with everything in New England, from the lobsters to the snow to the rocky coasts to the quaint neighborhoods amidst the bustling city life. Once I noticed that all of these loves were becoming the source of inspiration for my knitting projects, I thought would share my inspiration with the rest of the knitting community. Just as I have been inspirited by the work of others out there in internet world, I hope to bring you all a little piece of New England through a whole lot of knitting.